Ececo, the boy, has been saved today. Maurice has him in foster tonight. Next we are attempting to locate a place for the little Girl Jocylyn and one other rabbit named Talis needs rescue. Gentle, tiny lion head boy – just hit rescue list today. Weighs about 2 pounds. 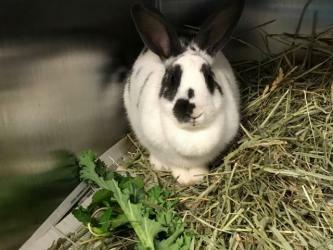 Shelter end dated bunny, Jocelyn saved! Elizabeth, a precious Haven adopter and foster, who recently lost her female rabbit stopped up to take in Jocelyn. Hurray! Thank you to everyone who helped us get Jocelyn to safety- Especially Elizabeth. Wishing Jocelyn happiness forever. 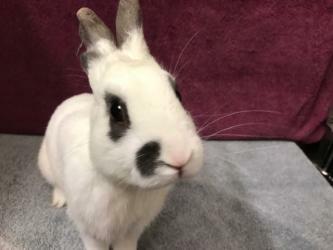 Two Shelter rabbits abandoned at a shelter need rescue ASAP. These little ones have nowhere to go – Call if you can help rescue-provide foster support. I am Jocelyn - I was abandoned at the shelter- I have only until 4-20 to get out- Please help me? I am confused about being here. I do not have much time left.